A couple of decades ago encounters and joint music-making between outstanding contemporary musicians (now known as improvising musicians) counted as eagerly awaited events. These encounters would be followed by passionate debates and analytical criticism. Today there is no trace of this. All of today’s serious and deep works live in exile from the public eye. It’s a blessing if at least the outcast nurtures the flame of true art, rather than writhing in the dust as a dying bird with broken wings. In autumn 2010 in Magyarkanizsa (Kanjiža) in the Vojvodina region of Serbia two authentic mature artists bGyörgy Szabados and Joëlle Léandre, met, realizing a longtime ambition. At this concert the heightened expectations of the audience were palpable, the promise of quality out of the ordinary. The concert has been a topic of conversation ever since. György Szabados* is one of the greatest channels for contemporary music and also a groundbreaking musical poet, who raises Hungarian music to a universal level. His organic musicality based in the Hungarian tradition, born in improvisation, but always harmonic, his balanced creation of form, and its precision, has long been admired by his fellow musicians in western Europe. They themselves have engaged in struggles no less heroic in the field of what is known as improvised music. Retaining the initiation into their own Tradition, free of visceral experiences they pursued to the end the only path possible: to seek the dimensions of cosmic man deep inside themselves, to lift from within the universal. Neither is this path easy, moreover the ills of white civilization weigh down on it heavily. The toughest battle was and is for the liberation of western man, entrenched in ego. As so often, the white man has again gone to the other extreme. With the sacred means of improvisation, he carried out the vivisection of the soul ad absurdum, making a fetish out of it, and the majority of European contemporary music foundered, far out from the shore but in the low tide of chaos. This problem can most spectacularly be seen in the phenomenon of the musical idea, that is, the melody or musical theme. In European contemporary music, in the absence of a living tradition, melodies and melodic fragments are selected from old composed European music or from black jazz or other exotic models. This superficial procedure is a sign of uncertainty and always results in a patchwork texture. It is, then, understandable that fellow musicians in Europe should wonder at Szabados’s oeuvre, which parades the completeness and unity of the archaic world and today’s ‘compost’ in a way unattainable for them. And more than this, the certainty of statement. (I believe the current world revival of Bartók has a similar origin.) On the other hand we too can admire the consistency, the versatility of western (‘improvising’) European musicians, their technical ability taken to the limits, because the lack of these necessary musical qualities is painfully apparent with the majority of Hungarian musicians working in improvisation. Joëlle Léandre is today held to be one of the strongest characters in European contemporary music. Her striking, dramatic bass playing is formed a sensitive but impassioned spirit. The frequent non-tempered sounds, conjuring up the arché, our primeval roots, are interwoven with the formal traits of European composed music, which an emotional soul combines with heightened nerves to form a whole. Their first joint music with Szabados was made in the spirit of complete openness, without any kind of rehearsal or pre-agreed framework. By way of a beginning the piano sprinkled some slow falling rhythms with a vaguely Asian flavour, as if inviting the bass to ‘dance’, which it accepts – thus setting off a modern large-scale piece in a suite form. This long number at times opens out onto a broad cosmic world, and other times withdraws into infinitely refined intimacy. The cries of loneliness erupting from the bass, its rasping pain, and the piano chords that cradle and protect it at times develop into a tempestuous dance, or take wing as a solemn hymn. Between the fearful expectancy of cosmic anxiety and the glad prospect of the Creator’s calm we feel the impulse of this concert. This music, of varying nature, linked to an emotional basis, is difficult to approach with words: from the conjuring up of ringing bells, through elementary sound gestures starting from the secure basis of medieval dotted rhythms through to the childlike simplicity concluding the second piece, it contains so much. Inner peace, a quiet calm, refinement, humility… – these were the phrases that rose to our lips after the concert. The piano, partly due to the nature of the instrument, held the proportions of the contours and steps in a sure hand, and initiated an aura that, developed jointly, arched from the musicians and the lofty music over the heads of the audience… but now, dear listener, put aside these stumbling words and trust rather your ears and your heart: trust the authentic experience this disc will give you. * when this piece was written we did not imagine that György Szabados’s death on 10 June 2011 would bring his oeuvre to a close. György Szabados and the New Dimension Workshop’s debut together was at the Miskolc Bartók-Тsaikovsky Opera Festival in 2004. The members of the New Dimension Workshop (the man of vision, Antal Babits, Csaba Klenyán, who was honoured with the Ferenc Liszt Award, and the excellent Ádám Jávorka) are talented and qualified musicians. All of them are reflective creators who deeply understand the essence of their art and at the same time accept their fate. Entertainment is not their only intent. They are serious musicians in the timeless meaning of the word. They do, they live, they work the miracle, they know that live music is the happy link between Heaven and Earth. 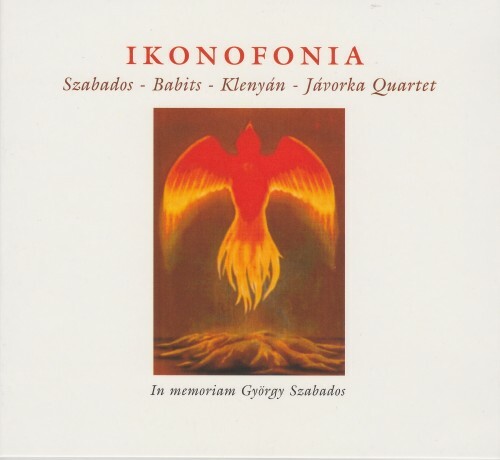 The material of the record was defined by the directing principles of Szabados, Babits, Klenуán and Jávorka alongside with the uplifting of the soul and the inner contents of the specified musical lines. In such a way that written music was living and reassuring for thousands of years.